MRCP(UK) has reviewed the current PACES exam and will be making some changes to the stations in 2020. The changes will build on the current format but develop some elements to make them more realistic for examiners and trainees. The examination will still test the same clinical skills, and there will still be five stations. However, some of the encounters are changing – more details of this are provided below. Why are we changing the examination? Postgraduate medical education has undergone significant changes in the ten years since the current PACES examination was introduced. The Shape of Training review, the new Internal Medicine Curriculum, and a number of different central government reviews have helped us to understand the expectations patients have of the doctors that treat them. The PACES 2020 changes are the product of a 12 month review of the examination, in the context of these developments, as part of the regular quality assurance processes all MRCP(UK) examinations have. These processes make sure that the examinations remain fair, relevant and fit for purpose. The history-taking station can be artificial with structured history-taking skills being tested in isolation. 20 minutes for a single communication and ethics encounter is felt to be rather long and in particular, the five-minute examiner/candidate interaction adds little value to the candidates overall assessment. The group also identified that in the brief clinical consultations there was felt to be a significant time pressure for both candidates, and examiners. Testing all seven skills in an integrated manner was very like real life but was very pressured in 10 minutes. 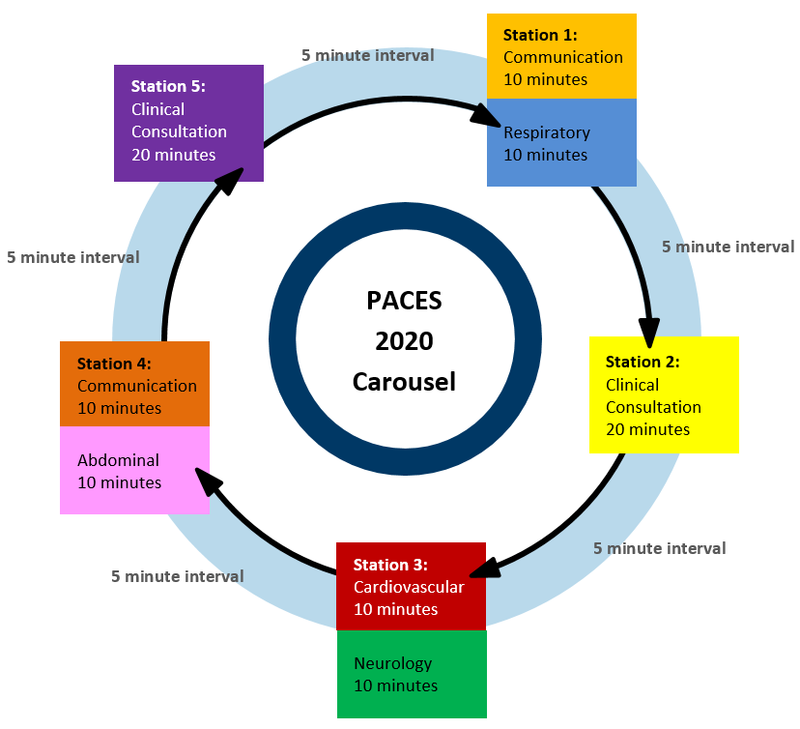 The group proposed to address these issues by introducing two new encounters to the PACES 2020 carousel that continue to test the same skills but in a better way. Two 10-minute communication encounters will assess candidates on their communication skills. These encounters will no longer include a question and answer section with the examiners, with the encounter being be judged on observation alone. Two 20-minute clinical consultations will assess candidates across all seven skills in a realistic and integrated manner. Candidates will have 15 minutes to take a structured history, examine the patient, explain the likey diagnosis and management and address any questions or concerns raised. There will then be a five minute question and answer section with the examiners. The new carousel will alter the sequencing of the encounters through the carousel. Physical examination encounters will be aligned with communication encounters. This will ensure that examiners at each station contribute more judgements in each of the skills for each candidate improving reliability. - MRCP(UK) is working with the Core Medical Training Advisory Committee to set up sessions in each deanery. These sessions are likely to take place towards the end of 2019, to ensure candidates are trained for the correct examination. - Training materials will be developed for examiners. These materials will be distributed by the three colleges to their examiner panels. - MRCP(UK) training materials for examiners will also be available on the MRCP(UK) website. We have produced a set of YouTube videos which will help explain the changes.